More famous for its bars and beaches, its also not a bad spot to find Java Sparrow! 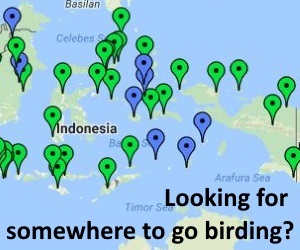 To find Java Sparrow around Kuta the best bet is to hire a motorbike or car and then drive north towards Canggu, or inland towards Denpasar, and take any interesting looking side-roads that enter agricultural areas. Look for places with ripe rice paddies, often recognisable from a distance as they have flags and streamers in them to try and scare the birds! 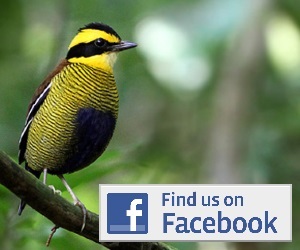 Munias are the most common, but occasionally within the flocks there are a few Java Sparrow or Streaked Weaver and possibly even Red Avadavat. The areas that have ripe rice paddies at any given time change constantly, so there is no real alternative for just motoring around, but this tactic is usually successful. The area of rice paddy directly in front of Canggu Sports Club has held a few Java Sparrow in past years, so that is worth a try. If you see a flock of birds in the distance there is no problem parking your bike or car and heading across the fields on foot to get closer to them. Try to stay on small footpaths if you can and don’t damage the narrow dikes that control the water flow. Access as above. Bikes and cars can be hired almost anywhere in Bali!